Gérard du Camino’s French guidebook to the Camino del Norte. I’d shared the results of research in this topic in an article entitled, The Hunt for a Good Camino del Norte Guidebook, in which I compared English, Spanish and French guidebooks. In advance of my 2012 Camino del Norte, after comparing what was available in languages I might understand, I dusted off my 5 years of high school French and bought Le Chemin du Nord, by Gérard du Camino. It proved to be a great choice — very thorough directions, maps, and accommodation info. The problem, of course, is: what if you’re an English speaker who doesn’t understand any French? Enter a new book, The Northern Caminos, by Dave Whitson and Laura Perazzoli. It was Whitson who noticed my Camino Forum post and alerted me to his new creation. After reviewing this new guide, I’m pleased to say a pressing need has been met. 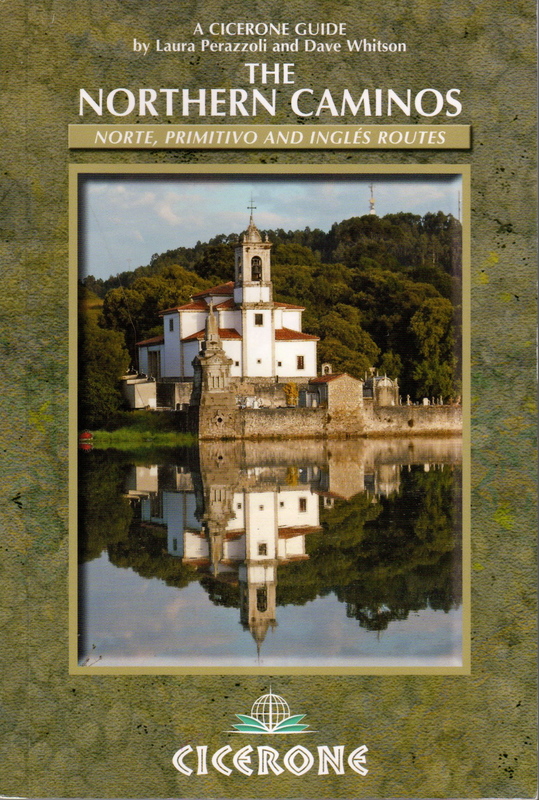 Whitson and Perazzoli have created a guidebook that will be a big help to English readers who choose the Northern caminos of the del Norte, Primitivo, and Inglés. The guide offers real to-scale maps (hear us, O John Brierley), good historical and cultural background, and a warm and readable style that quietly assures pilgrims that they’re in good hands. Whitson and Perazzoli’s new guidebook to the Northern pilgrimage routes to Santiago. That’s not to say I fell in love with this guidebook. There are a few details that I hope will be amended in a second edition. One of the most helpful planning tools a guidebook can offer is a chart of each day’s elevation profile. It’s a big help to know when you’re just about to reach an 800 meter climb, or when you’ve finished your ascent and can rest and prepare for the climb down. Unfortunately, this guide offers scant elevation help, giving only total ascent and total descent stats for each day. The authors’ descriptions can be so sparse as to be unhelpful. The Ribadesella to Sebrayo stage, a 31.5 km march that ends disturbingly at the Sebrayo albergue that has no grocery store or restaurant nearby, is a good example. A word of warning about this important detail at the beginning of the chapter could be very helpful for pilgrims. Instead, we learn in the chapter’s last phrase: “Sebrayo: Albergue de Peregrinos …. but no food of any kind.” In contrast, the French guide warns upfront that “revitaillement” (resupply) must happen at Ribadesella. Lots of blank space on many pages. A mildly annoying feature of this new guide is the rather generous use of white space. When a person is carting a camino guidebook across hundreds of miles it’s great to know it’s jam-packed with as much info as possible per kilogram. Hopefully the next edition will ditch the artsy white space and fill it instead with other helpful content that pilgrims would rather carry. There are a few other quibbles. 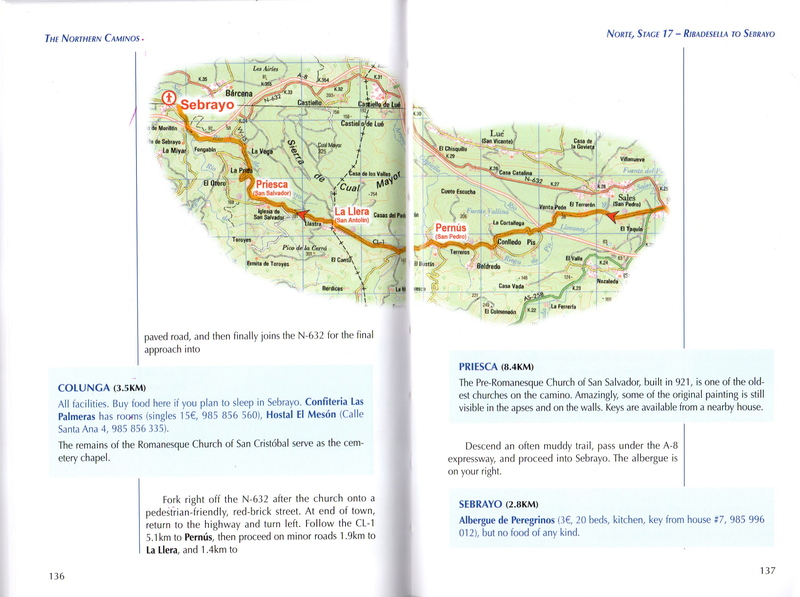 I’m not sure why the book’s La Caridad to Ribadeo Stage (p. 168 ff) recommends a southerly route through Brul rather than a route to Tapia that would follow the scenic coastline through Santa Gadea toward Ribadeo. Whitson and Perazzoli suggest that the waymarking is not sufficient, but their book could provide a detailed description that would adequately guide a pilgrim even without excellent way marks through an uncomplicated coastal walk. On this stage I’d certainly take the Tapia option and then follow the coastline toward the Ribadeo bridge. Flaws? Well, sure. But these guidebooks are often revised in subsequent editions, and they become better and better over time. What we have now is a very good start, and Whitson and Perazzoli are to be commended — and thanked — for a great contribution to the needs of English-only del Norte pilgrims.